All transactions are safe and secure with a reliable history in online purchasing behind each of our associates. 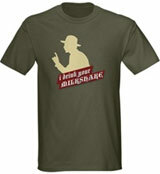 Buy the Daniel Plainview Milkshake t-shirt to own There Will Be Blood clothing and merchandise. Prospector Daniel Plainview accidentally discovers crude oil deposits on land that he was intending to mine for silver. This begins Daniel's nearly thirty-year obsession with oil drilling. Along the way, he becomes one of the most successful oilmen in California, leasing various plots of land owned by ranchers for drilling. The design on these There Will Be Blood I Drink Your Milkshake t-shirts features a silhouette of Daniel Plainview above the movie quote. In addition to the Daniel Plainview Milkshake tee above, browse the There Will Be Blood Clothing Gallery for more apparel like men's and women's clothes, kids shirts or hoodies.